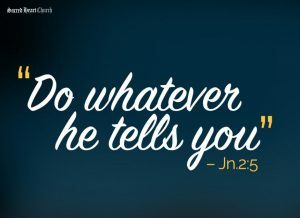 In the story of the wedding at Cana, we hear the last words uttered by the Blessed Virgin Mary in the Bible: “Do whatever he tells you.” Mary doesn’t speak often in the Sacred Scriptures, but every time she does speak, her words overflow with wisdom. Mary was the very first Christian and she teaches us that obedience to God is the true path to life and happiness. No act of service is too small or insignificant for Jesus to bless. Jars filled with water He blessed to be choice wine. Imagine how Jesus will bless our parish when we each of us steps up to offer my service, no matter how small! Jesus wants to bless our parish, but He needs our ‘efforts’ to bless!